←When Learning Gets Hard…is it Time to Quit? 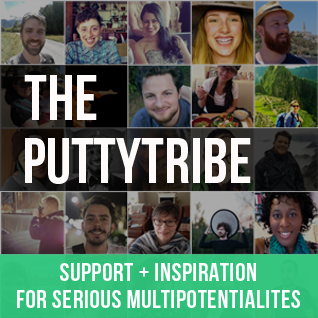 Note from Emilie: This post is a collaboration with some of the awesome multipotentialites in the Puttytribe. It depends where you’re at and what you’re struggling with! If you’re trying to sort out a multifaceted career, I can give you advice about finding multipod friendly work. If it’s productivity that’s holding you back, I’ve got some other suggestions for you. Having trouble branding yourself or explaining your value to others? I’ve got some thoughts to help with that, too. But my advice will be different depending on the context. Without knowing more about this hypothetical multipod and understanding where they’re at in the process of accepting their multipotentiality and harnessing their superpowers, it’s really hard to dispense advice that isn’t overly general. Okay okay, I know, we’re on a schedule. We need a snappy takeaway. This is the age of clickbait, short attention spans, TL:DRs. I get it. This question is not going away, so I recently spent some time brainstorming different possible answers. I also reached out in the forum of the Puttytribe to see what advice other multipods would give. Behold 5 “best” pieces of advice for multipotentialites. (Cut us some slack, we’re crowdsourcing!) The beauty of this list is that any one of these could stand on its own. Next time I get this question, I’ll pick one to share. For now, because this is Puttylike and we’re all fans of the plural, I’ve included five. Multipotentialites are often terrified of choosing a particular path because we think that choosing something might preclude us from choosing any of our other interests. This belief can paralyze us and stop us from taking any action at all. The truth is that there is a vast middle ground between doing everything under the sun (sadly impossible) and doing just one thing. In other words, you can do a heck of a lot over the course of one lifetime! So don’t be afraid to move forward with something The life of a multipod isn’t Refuse to choose*—it’s Choose. Choose again. *No disrespect intended to Barbara Sher here. I think she would probably agree with this advice. And I think the title of her book is meant to mean something like: “Refuse to choose just one thing that you’re going to do forever and ever”…but that would be a long title. You will figure it out – you will come across something that helps make the decision you’ve been agonising over; you will find someone to relate to who makes you feel less isolated; you will learn to accept and value the opportunity which is forging your unique path; you will learn to focus on the important stuff and let go of the rest; you will learn to work with your own nature. and you will find a way to stop procrastinating (at least temporarily)! So relax, take some action and pay attention – the rest will come. Sometimes we lose interest in an area that we once loved or that we maybe even built our whole life around. Perhaps our body has been telling us (through signs like boredom) that it’s time to move on for some time now. When this happens, it’s easy to feel crushed, to worry about what other people will think if we move on, and even to experience existential crises! It can feel like, without this one identity or role, we won’t know who we are anymore. To help prevent this from happening, try not to get all of your validation from “what you do” or from one version of yourself that you put out into the world. You are not your job or medium. You are whole without any of that. Plus you’re a multipotentialite, so shifts in direction make perfect sense. We want so badly for our lives to have meaning and we want acceptance and understanding from the world around us. That’s human nature. But realize that your life has inherent value. Your sense of self will be much stronger if you cultivate an inner sense that you are enough, rather than tying it to what you do for money. My advice would be to focus on the positives that we have the edge on, the places, the people, the work opportunities that welcome us. Places filled with variety, people who welcome new integrating innovative ideas and activities, those types of income generation opportunities that appear to be designed just for us. Increasingly employers, industries, role definitions, organisations are seeking to be innovative and agile to be sustainably successful. Guess who naturally is innovative and agile? That’s US! And when I looked around at those people I have wonderful connection with around the world through my newly acquired Hummingbird lens I realised just how many of my friends are multipotentialites. Boiled down, this is: focus on what you already have or on where we are already welcome … rather than on what is missing or broken. Often when multipotentialites become interested in something new, we wonder whether it “makes sense” to pursue that thing. Sure, we need to consider our limited time and our financial commitments, but often our worries have less to do with these issues and more to do with how we see ourselves. 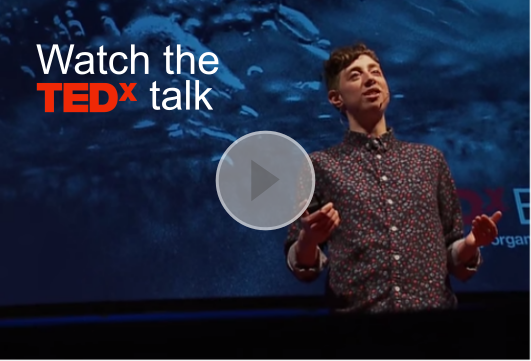 We worry that the new thing we’re drawn to is too different from what we’ve explored before. We may not understand how it fits or makes sense or how we’ll explain it to other people. Look, it’s okay to have contradictions and be a complex human being. We can look for our Whys and try to understand the themes that run through our various passions. Sometimes these connections become clearer looking backwards. But it’s also okay if you happen to be interested in something that doesn’t seem to fit with what you’ve done before. Trust your instincts and listen to your curiosity. You’re being drawn to an area for a reason. That reason might not become obvious for years to come, so have fun and don’t overthink it. Pursuing something simply because it enriches your life is enough. Note: after I drafted this blog post, a bunch of other great replies came in in the Puttytribe. Props to Wendy, Ed, JC, Meg, Darren, Izzi, Georgy, Nick, Doug, Alicia, and Glen! What’s your best piece of advice for multipotentialites? You know, if you had to choose just one. 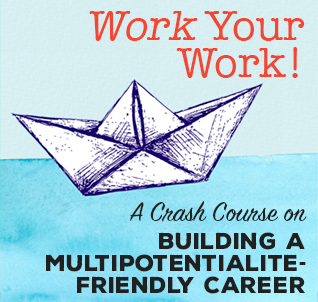 Could you use more multipotentialites in your life (and corner)? We’re accepting new members in the Puttytribe on Tuesday, June 6. Learn more about our awesome community here! 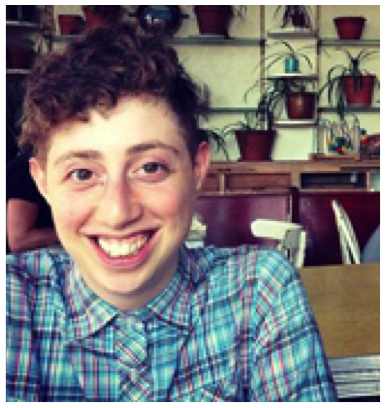 Emilie Wapnick is the Founder and Creative Director at Puttylike, where she helps multipotentialites build lives and careers around ALL their interests. Unable to settle on one path herself, Emilie studied music, art, film production and law, graduating from the Law Faculty at McGill University. 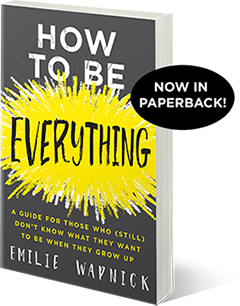 She is the author of How to Be Everything: A Guide for Those Who (Still) Don’t Know What They Want to Be When They Grow Up. Learn more about Emilie here. Live and be mindful that today is all you have. So embrace, appreciate and love what you are given today and don’t sweat the future. Thanks Emily, this was perfect timing for me! I’m currently pursuing a career path that has been a lot harder than I thought it would be, and I’ve been starting to question why I’m doing it. However, once I get to the point where I’m DOING rather than LEARNING so much, I’ll have the freedom to pursue other interests, plus most likely combine it with other things. This blog post helped remind me that this is only part of my plan, and that I’m right in following my instincts even though it’s been more difficult than anticipated. Onward and upward! Right on, Amy! It can be hard to keep the big picture in mind when you’re deeply involved in something new. But that’s a smart distinction you made between doing and learning and a good thing to know about yourself. You’ll get there. Keep learning. Becoming stagnant is the worst thing for people like us. Take a class that you’ve always wanted to take- and it can be completely unrelated to what you do for work! This will help you continue to realize your value outside of your job title. It will help you keep having fun, and satisfy your craving for constant multi-tasking. I think this might be the most important for me! School was always my favorite, because I took so many different kinds of classes. Now that I have a job doing similar tasks every day of the week- I need to mix it up more or I’ll go crazy! Great advice, Sarah! And I loved school too, for this reason. So yeah. How do you know if it’s time to move on or if you’re just running away? Any advice appreciated. I was going to wait until the puttytribe opening, but I figured with this article might as well. Hi Sarah, I do exactly the same thing that you do! I’m always afraid to change course because I don’t have a lot of money and I don’t want to “waste” it on an interest that could be gone in a week. I suggest separating your interest (drawing) from the major financial decision (art school) so that you can pursue your interest without the guilt associated with making a big life change for something you aren’t quite sure about. Is it enough for you to “test drive” drawing for a little while? Maybe get a few starter supplies on Amazon, watch YouTube tutorials, take local classes, and try doing it on the side after work? If you still enjoy it after a while, you could even try to sell drawings on Etsy – which would also help you pay off your loans even faster! Start small, and see if the path is still leading you to art school, or if a different exciting interest pops up. This way, you still have the safety net of an income and family support while you’re making up your mind. You’ll have the freedom to be much more honest with yourself about whether it’s something you feel like you need to pursue professionally. I’m definitely not saying that you shouldn’t go, but there are other ways to pursue drawing while you pay off your loans if you’re worried it might not work out. I also know how draining it can be to try to squeeze in an interest around a job, but if it’s worth moving across the country, it’s probably worth the time and effort after work for a few weeks while you make up your mind. As a poor college student, this is part of how I have decided to handle my multipotentiality while I work on my degree. I hope this helps you too, and good luck! I draw on the side now, but I’m not progressing as much as I want to. The dream would be to do commissions and a web comic but I’m not at that skill yet. I bought so many supplies! I have pencils and pens, hundreds of sketchbooks, a digital tablet, copic markers and more lol. I’ve always been in love with art stores And when I took my first drawing class I loved it. I worry i’ll get lonely or bored doing illustration full time though. There’s also the fact that I studied something totally different in school. I don’t think my parents would approve the change of pace and I don’t want to think my degree was a waste of money. I found a good middle ground in industrial design but my state doesn’t have any classes (thus the moving cross country) and I’ve tried to study it some myself and I get bored. I’ve never been very disciplined though and I hate starting slow (which you have to do to gain prerequisites) its a mess. I will keep what you said in mind though. its good advice and it does help my drawing urge even if I can’t do it for long enough. Thanks! Have you looked into Skillshare? It’s $10US a month, and there are plenty of illustration and design classes, including industrial design. That might help you make your decision, plus you can talk to the instructor and ask questions! It’s really easy to feel like you need ‘credentials’ or outside approval before you have permission to pursue something professionally. But, in the art world especially, this is not the case. I think of sites like Hyperbole and a Half and The Oatmeal (though I’m not well-versed in web comics, those are just the obvious ones that come to mind). But neither creator had formal training. You can be (and probably are becoming) quite skilled sans formal education. Like Kelly, I’m not saying don’t go to art school. But if your ultimate goal is to do commissions and a web series, you absolutely don’t NEED art school for that. Might you be struggling with some fear and imposter syndrome here? What if you pursue your web comic and really give it a try — test it and actually see if you can make it work and if you enjoy it. Well, Sarah, you’re definitely not alone in this. I’ve had the same job (although fortunately in variations) for the past 14 years, and I’m sick and tired of it – if only because it’s so energy draining that I have neither the energy nor the time to really pursue something else by the side. I’ve been contemplating and occasionally trying to get out for several years. The problem is first of all choosing (too many other things I’d want to try my hand at and of which I think I have at least a decent level of skill and experience, even if mostly undocumented), and secondly money. Like you, I don’t have a partner to rely on to bring in the dough, so I can’t neglect the financial side of things. So if I’d choose something and get bored with it pretty quickly (as I do quite often), that’s a serious problem. My dream: a super well paid and yet varied part time job, so I’d have both the money and the time to study next to it whatever catches my fancy. An open bachelor’s degree at the Open University is something I’ve been looking at for years, but I lack both the time and the money for it. The conversatory is another dream, but if I’ll ever make it there…? Maybe someday we can have it all. Yeah, I know what you mean. “Live in order to work” instead of “Work in order to live”… The first is the wrong order, as far as I’m concerned, but that’s what I’ve been stuck in for years and years now. Stay agile. Make a move or at least be ready to make a move. #4 on your list really resonates with me. I like to temper it with this additional suggestion: Don’t tie your identity or sense of self to other’s opinions. Are others’ opinions useful for a particular product or service you provide? Sure. Should they be extrapolated to describe you as a person, as a creator? Never. My one gem of advice for multipotentialites?… Hands down… don’t be a victim to perfectionism. This is good advice for anyone (not just multipotentialites). But the temptation to juggle, develop, master, explore all of your interests can (and will) lead to burnout, unmet expectations, anger… and if turned inward… depression. As Emilie puts it – we have superpowers – but I am sure that for many of you (like me)… perfectionism is an arch nemesis. Enjoy, embrace, celebrate your plurality… push the envelope of your interests…but try to just laugh at unrealistic expectations of yourself. Loved this. I find when I’m in a muddle, if I stop, listen, sometimes just write nonsense, the path shows up. Because I’ve done all the writing and scribbling, if I’m lucky – I’ve also got some action points to work from too. Personally I think “#5: If your heart is pulling you in a particular direction, listen” is the best advice. So often I’ll want to go a certain direction and I’ll have people all around me telling me that it’s odd or different or “Wow! That’s the complete opposite direction.” and they don’t mean it in a negative way most of the time. Comments like that always stuck with me though and often I’ll find myself thinking ‘What the hell am I doing with my life?’. When I felt the pull to become a Remedial Massage Therapist and put my Graphic Design on hold there really wasn’t much holding me back. That said it took me nearly 2 years to finally take that step mainly because I was so caught up with thought’s like ‘Is this really the right thing to do?’ and ‘Shouldn’t I really be doing more with my Graphic Design?’. But taking that step was the best thing for me. No one in my life really understood my need to go that direction but I have definitely come to the understanding that you heart and body knows what’s best for you(most of the time). If it feels right, it usually is. I love number 5, I’m going to use that :-) Cheers! Best advice, eh? Two words, in big, capital letters: STAY CURIOUS. I’m so happy to know that I’m not weird as I thought!Thank you! But there is still a problem with me. I can deal with being a Multipotentiality. Frankly, I really like that! But others deny that I am a Multipotentiality. This is because everybody wants me to study medicine and they say I must focus on my studying and nothing else. I am really getting discouraged abouth my other interests. Any suggestions?